HOUSTON (KTRK) -- A month ago, Houston police officer Richard Martin died in the line of duty when he was run over during a police chase. 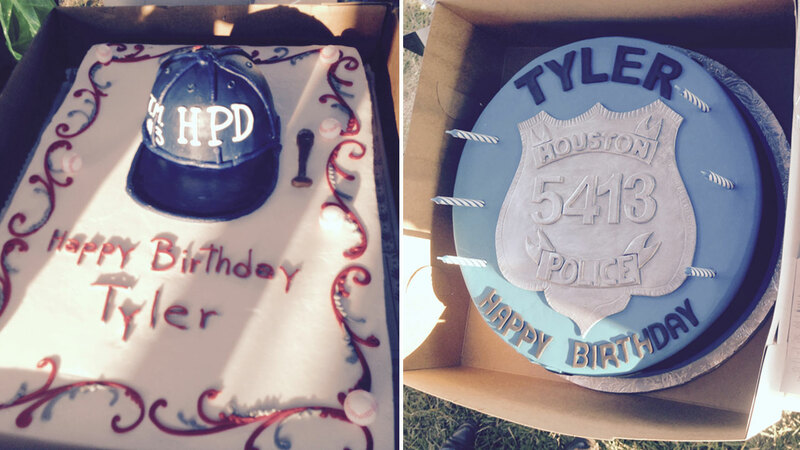 On Wednesday, his fellow officers came together to wish his son a happy birthday. They threw a party for 12-year-old Tyler Martin with his baseball team in northwest Harris County. Officers and teammates released blue balloons in honor of Tyler's father. Then they celebrated with hot dogs, cake and a box full of presents. Tyler's mother says she's overwhelmed by the love and support the family has received. "He had lots of fathers with him today. And it just means a lot to our family. And I know Richard's very proud, very honored that his blue family has stepped up the way they have," she said. Tyler says he plans to spend his summer playing baseball and hanging out with friends. Martin also left behind a 22-year-old daughter.